Remember my friend who returned from her honeymoon last week to my brie and rosemary mac & cheese in her fridge? Well I also threw her a little "Newlywed party" this weekend (she's starting to sound really spoiled, I know). Like many brides, she was abstaining from sweets and cheese and all things good during the lead-up to her wedding. So for the party I made mini fontina and cheddar grilled cheeses, following Food52's guide to making the perfect grilled cheese sandwich. I love that they cover making several for a crowd - their advice was perfect. I blended rosemary and thyme into the butter, and the extra flavor made the sandwiches much more special than a normal grilled cheese. I paired them with an arugula salad with apples and roasted sweet potatoes and a blackcurrant apple vinaigrette. 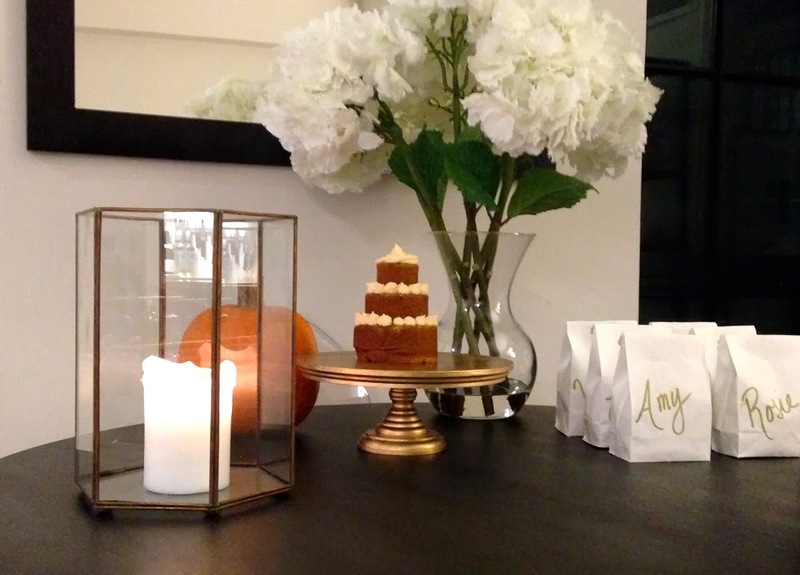 I wanted to incorporate something wedding-related, in case our bride was in danger of the post-wedding blues, so I made mini tiered pumpkin wedding cakes. I used Bon Appétit's recipe for Pumpkin Spice Cake with Caramel and Cream Cheese Frosting (tripling the spices as I usually do for pumpkin recipes). This is such a great recipe because it works wonderfully as a layer cake, cupcakes, mini loaves, or molded cakes. It's not too sweet, so you could even get away with skipping the frosting and making it into muffins. For these cakes I used this Chicago Metallic Multi-Tier Cake Pan. A note about this pan: it is very dark, so if you use it, lower your oven temp to 325. It was much easier to use than I predicted; by properly buttering and flouring the pans each cake came out perfectly. One recipe makes 4 cakes (they serve approx 3 people per cake). The bags are filled with apple cider caramels (we'll go over those another time!) No matter how small a party, I always think it's nice if the guests have a little something to bring home. This party was in the afternoon. A tip for hosting an afternoon party: it is even more important to prepare in advance, because the morning will get away from you. In this case that meant baking the cakes, making the favors, and shredding the cheese. Also round up any serving items you'll need the day before. This way right before your guests arrive all you have to worry about is the atmosphere. 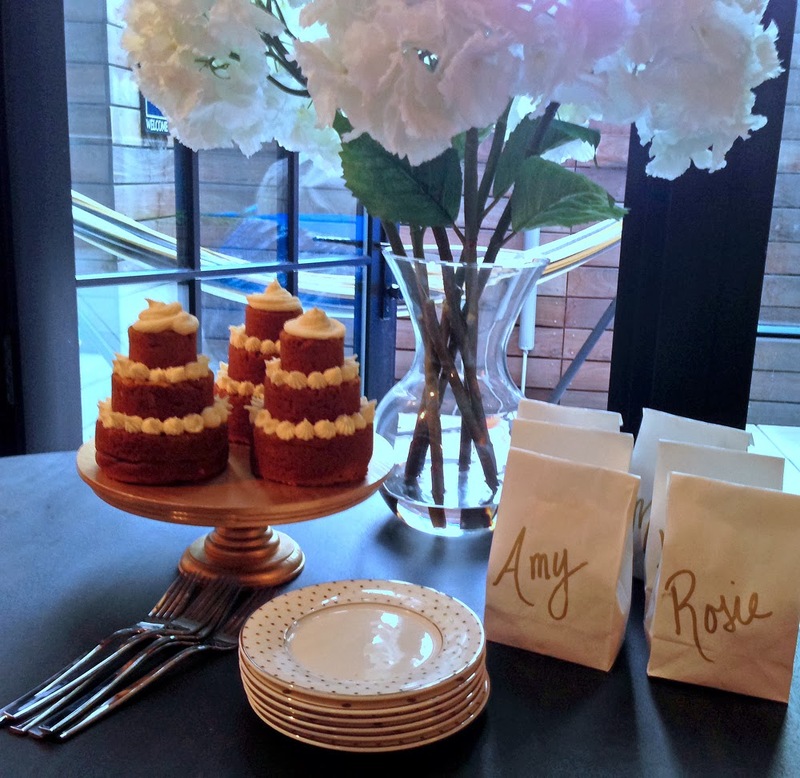 I really think that the Newlywed party is a perfect way to end the series of events that come with a wedding and ease the transition back into reality. You may think that yet another event would be one too many, but it's actually really nice to get together after the wedding in a lower stress environment, but still with celebratory elements. There's the engagement party, the shower, the bachelorette party, then the wedding itself and then...wait, it's over?! The Newlywed party gave us a chance to hear about the honeymoon and trade funny stories from the wedding - sometimes the best part! And also to help solidify burgeoning friendships between the bride's family members and friends. Such a great way to celebrate beginning married life!